14 Acre Sea to Sea Estate on private beach. The Authenic Out Island Experience. - the sound of the ocean kissing the shore. - wind rustling through the coconut palms. Casuarina Bay is an exceptionally beautiful, secluded eco-friendly Sea to Sea estate on the island of Eleuthera, in the Bahamas. Just two properties, next door to each other, share this very private bay on the Atlantic, skirted by miles of pink sand beaches. Easily accessible, Casuarina Bay is just 1 hour by air from Miami, and only seven miles from Governors Harbour airport. It's located 1.5 miles northeast of the lovely village of Governors Harbour, one of the oldest settlements in the Bahamas. The house was designed to take in the extraordinary views and off-shore breezes of the Atlantic Ocean from every room as well as the virgin land and spectacular sunsets to the west. It nestles amidst picturesque groves of Coconut Palms, Papaya, Sea Grape, Sea Apple and Casuarina trees. The fragrant frangipani waft their intoxicating aroma while the hibiscus bloom fresh flowers each morning. The property is also blessed with other exotic plants such as ponciana, sour orange, surinam cherry, guinep, soursop, sapodilla and passion fruit. Ocean-lovers will find some of the best snorkeling, scuba diving and swimming in the world. Underwater visibility is up to 100 feet, with water temperatures ranging between 70 and 80 degrees Fahrenheit. It's hard to find a more beautiful sea anywhere in the world. Sit back and delight in the changing colours of the sea and sky. Or jump in and watch the magic below the surface. There's a barrier reef just offshore so Casuarina Bay Beachfront House has protected waters and no rip currents. It's excellent swimming for all ages. For more information and many more photographs, please visit the link at the bottom of the page. The adventurous traveler can explore nearby islands and virgin coral reefs, swim with dolphins or exotic tropical fish, or charter boats for world-class bone or deep-sea fishing. Other sports available on the island include sailing, kayaking, paddle boarding, spearfishing, tennis and surfing. 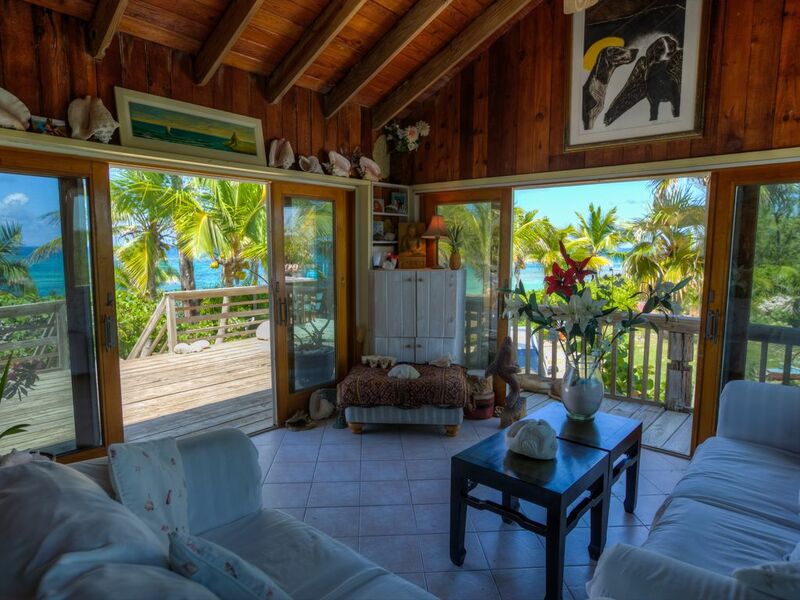 The rustic Beachfront House was designed and built to savor the incredible natural unspoiled beauty of Eleuthera. It's only 20 yards from its own pink-sand beach, so wherever you are in the house you have breathtaking views in all directions. To the east you see the turquoise ocean and glistening beach. Looking to the west your eyes rest on untouched green hills and colourful Caribbean sunsets. At night the brilliance of the stars and moon are unforgettable. This romantic wooden house sleeps up to 8, with 4 bedrooms (1 king, 2 queen (1 with A/C) and one with twin beds that can be made into a king- also with A/C), 2 bathrooms, living and dining room, kitchen, decks on 3 sides(with 2 tables for al fresco dining). Two of the bedrooms have air conditioning. The other two bedrooms and the living areas and kitchen do not have air conditioning, but instead they have large doors/windows to capture the ocean breezes and fans. The garden (queen) has exterior access only. Relax on our private beach in the thatched cabana, with a freshwater shower. This is a perfect location for the adventurous traveler looking to enjoy the natural beauty of this magical island. Amenities: Free wireless Internet, Phone, satellite T.V + VCR, CD and tape player, large fridge, high powered gas stove, dishwasher, coffeemaker, blender, toaster, barbecue, washer and dryer, kayaks, beach cabana with outdoor shower. Activities: Spend days exploring deserted pink sand beaches, kayaking along the coast or snorkeling or diving exquisite reefs just in front of the house from our ocean kayaks. Excellent fishing- deep sea (for tuna, mahi mahi, kingfish etc. ), bone-fishing, bottom fishing, line-fishing or spearfishing. Go to the weekly village fish fry and meet some of the local characters. Sit on the beach at night and watch the stars or the moonrise. Very private, protected pink-sand beach 20 yds/metres from the house. Thatched cabana with freshwater shower on the beach. Excellent swimming, snorkelling, kayaking, spearfishing right in front. 1.4 miles to quant, friendly village of Governors Harbour. A pleasant 15 minute walk -mostly along a pink-sand beach- or a 5 minute drive. A/C in two bedrooms, fans in all of the rooms. We have 2 sit-on-top ocean kayaks and 2 stand up paddle boards. We do have a boat available for chartering. Huge new deck (on 3 sides of house) completed in 2018. We have stand up paddle boards. The twin bedroom (main level) and garden (queen) bedroom have air conditioning. Children's equipment (car seats, high chair, swing, booster seat, stroller etc) can be available on request. Fall asleep and wake up to the soothing sound of the ocean. Other Activities: Wonderful snorkeling, swimming and kayaking right off the beach in front of the house. The 2 best beaches on the island are on either side of you: Club Med (French Leave ) beach and Twin Coves both only 5-7 minutes walk. Close to Governors Harbour and restaurants but you have the privacy of only one other property on the whole bay. Fantastic if you want to get to the best beaches without driving - for your morning coffee or to watch the moonrise.